Without missing a beat the show begins with a truck, shot at an angle to make you think for a moment that it’s a black jeep (like one used in 2004), pulling up to a familiar house. That’s right – we’re back in Reefside at the home of Doctor Tommy Oliver, a paleontologist and dinosaur enthusiast. As he gets out of the truck (a very nice one we might add … that’s black and tan, hmm) we see Doctor O himself chatting on the phone. He’s talking to someone about his morning and that’s going to take someone named JJ to school. As he walks up to the steps of his house he picks up a bike. And then the collective Power Rangers fandom lost their mind at the response. That’s right – Doctor O, aka Tommy Oliver, aka “Aww man”, aka “I forgot my _____”, aka random race car driver is now a father. But before Tommy can open a can of fatherhood on his son, some red portal opens and we hear a voice call out “Hello Tommy Oliver”. We flash to the Super Ninja Steel Rangers about to play some pool in their high school (I never got to play pool in my high school). Before they can get started, Mick tells them they have to go. Three cloaked figures (carryovers from the previous episode) appear. The team wants to know who they are and finally the three mysterious figures agree. The Time Force Red Ranger, RPM Silver Ranger, and Dino Charge Blue Ranger reveal themselves. Levi expresses confusion – they know of Wes and the Time Force Rangers, but they’ve never heard of a Dino Charge or a RPM Ranger. Wes explains that there are different dimensions out there and that Power Rangers exist in all of them. They’ve come now, using a device created by the Time Force, that can cause issues with the Morphin Grid but they’ve had no choice but to use them. The Super Ninja Steel Rangers haven’t the foggiest what’s going on so Wes tells them they need to find Tommy Oliver. The team has heard of Tommy Oliver and they agree to go to Reefside to find him. At his house the Rangers discover that Tommy has turned evil and is helping a being known as Lord Drayvon, from the Antiverse dimension, to kidnap Power Rangers for an evil Ranger army. Lord Drayvon is working with Madame Odius to shoot three Mega Arrows in to the sky to break the barriers between dimensions thus allowing the evil Ranger army to conquer all of reality. Tommy reveals he is actually a robot and the Rangers decide to follow Lord Drayvon to get the arrows and to find the missing Power Rangers. At Lord Drayvon’s castle we see that numerous Power Rangers have been captured. As the evil Tommy mocks them, an explosion occurs knocking out Drayvon’s ability to create more evil Rangers. The other Rangers are approaching his castle when they become surrounded. But an invisible figure with super speed defeats the bad guys and reveals himself – it’s the Dino Thunder Black Ranger, who demorphs to reveal that it’s Tommy Oliver. He explains that Lord Drayvon and his crew didn’t realize the Black Dino Gem grants the power of invisibility and so he used it to escape. But they need to get the Mega Arrows and free the other Rangers. The team splits up. The Super Ninja Steel Rangers end up battling Lord Drayvon as he fires an arrow in to the sky starting the process of reality crumbling. The Rangers think they’ve defeated him, but he’s too powerful and shielded their attack. The team regroups. Inside the castle, Wes, Gemma, Koda, and Tommy free the other Rangers. Before they can escape, the evil Tommy robot stops the real Tommy and challenges him to a fight. The robot morphs in to the Dino Thunder Black Ranger. Tommy responds by revealing his new weapon – the Master Morpher – and uses it to morph in to Zeo Ranger V, Red. As they fight, Tommy morphs again in to the Mighty Morphin White Ranger, and eventually the Mighty Morphin Green Ranger, and defeats the evil robot. NOTE – In an extended scene, Tommy morphs first in to Dino Thunder Black, battles, and has his helmet cracked open. He then morphs in to Zeo Ranger V Red and the scene continues. As the Rangers steal the Mega Arrows, Drayvon manages to fire a second arrow. Only one more arrow needs to be fired now for reality to crumble. Drayvon summons his evil Ranger army to battle the Super Ninja Steel Rangers. But before the battle can begin, the 10 Legendary Rangers appear and morph in to action. It is now 16 versus an army. The Rangers are victorious but Madame Odius will not be deterred – she gigantifies Drayvon and he fires the final arrow. Tommy, in a scene that has to be watched to be appreciated, morphs in to the Mighty Morphin White Ranger and summons the Falconzord, flying up to catch the arrow. He then flies back to Drayvon as the other Rangers fire their weapons at him, letting the final arrow crash in to Drayvon and destroy him. The Power Rangers have proved victorious. As the Rangers say their goodbyes and return to their home dimensions, Brody takes a second to say his catchphrase of the series – “Now THAT was epic!”. And thus concludes the Power Rangers 25th Anniversary Episode. The poster child for the franchise showed in this episode that he still has “it”, whatever “it” is. Just being on screen it causes everything to gravitate towards him. Love him or hate him he is the most popular Power Ranger of all time. The fact that he has returned more than any other Power Ranger also shows his respect and love of the brand, and you can’t help but respect the man for that. This brand new morpher isn’t a toy yet and we don’t understand why. This thing is awesome – essentially a Green Ranger morpher with some red circuitry stickers and a green backing inside, the morpher allows Tommy to change in to all his various Ranger incarnations with a simple morph call. This needs to be a thing and needs to happen to more previous Rangers. It was nice to see our old friends. We didn’t feel any “…why did they bring him/her back?” moments like we did with the Legendary Battle. However, this is also going to be part of “THE BAD”, so hold on tight. Still trying to pick my jaw up off the floor. The greatest moment of the episode featured the return of the iconic Falconzord as Tommy and it saved the day. I would take an entire episode of Tommy just summoning his old zords to stomp around and save cats stuck in trees, no joke. It did what it needed to do in 22 minutes, but can you imagine if this had eclipsed the 36 minute mark as a 45 minute episode? Or even more than that? It leaves us foaming at the mouth, mostly because we totally believe what got cut from this episode wasn’t “more Sentai footage” like you saw in the extended cut of the Legendary Battle. – Who is that White Ranger? Is that Mighty Morphin Red? Remember Trent? Or Rocky? The guys cutting the episode sure didn’t. Two fan-favorite characters, or at least suits, with very little screen time. We didn’t even get to see Trent fight the evil Ranger army. And it looks like Mighty Morphin Red’ suit actor couldn’t figure out how to act while firing a laser should look. – Are they or aren’t they? Is it Tommy and Kat? It sure felt that way with the random handhold at the end of the episode. But at the same time fans are dying to know if it truly is that. SPOILER – the upcoming “Soul of the Dragon” comic, which is stated to be considered part of “show-canon”, has Tommy and Kat married with a kid ironically named JJ. We wish the show wouldn’t tiptoe around certain things, especially who the most iconic Power Ranger ends up with, but at the same time the mystery is fun (but not the arguments online, whoa!). While this may not be the episode every Power Rangers fan was hoping for, this was the episode that the Power Rangers brand itself needed. Iconic scenes, a new morpher for the most popular Power Ranger, and enough nods to continuity to silence a majority of older fans begging for the show to feel connected to the shows before it. All in all, this was a great episode and a great anniversary episode. While it may not be the best anniversary episode (looking at you Forever Red), it corrected nearly every misstep from the tragedy that was the “Legendary Battle” from Power Rangers Super Megaforce while still giving enough to the diehard fans to foam at the mouth over. 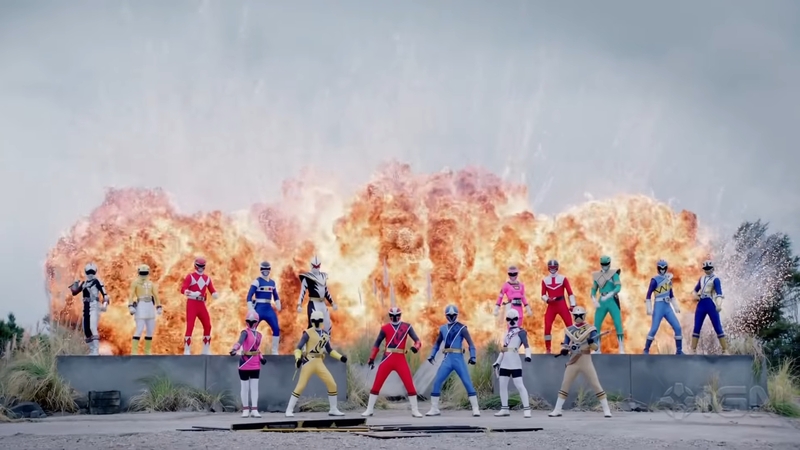 A proper and fitting sendoff for what was the last series of episodes produced under the banner of Saban Brands. Now, how will Power Rangers Beast Morphers do? We eagerly await our first look at that sometime late this winter/early next year. Celebrating 25 YEARS of colorful adventures, heroes from across the Grid unite to save the world. Airs in PRIMETIME, 8PM EST! Ok. I agree with Brody. First episode I've seen since Dino Thunder and I thought it was amazing. Such an epic episode. Tommy's Master Morpher was pretty cool and seeing him use all of his Ranger forms (minus Turbo) to take down his clone was fantastic. This entire episode was way better than Legendary Battle and had a great premise to it, even though there are things left unaddressed. Overall though, it was a great episode worthy of the 25th anniversary of Power Rangers. They're fighting against time and want to incorporate the ninja steel team as the center heroes and heroines make things worst. For a prime time release, you expect a one hour special that cater to the older fans, but we're getting speed up one liners one after another along with all those annoying catchphrases. It's still an A compares to the rest of recent neo Saban era episodes I've seen. I don't know if jdf improv some of his lines, but it makes him egoistic as heck. The ending gave me a rush of emotion honestly. So I guess this makes Soul of the Dragon canon now huh? And I thought the mobirates was awesome. To hell with that, master morpher FTW.